"Really clear and expressive. Sounds like someone just cleared out all the gunk from inside my ears." Joel Farland is one of Australia's leading musical directors, producers and drummers. His expertise in production and creating a vision for live shows has led him to Musical Direct performances for Peking Duk, Rita Ora, Charli XCX, Hayden James, Amy Shark, Cosmo’s Midnight, Conrad Sewell, Lisa Mitchell, Elk Road, Carmada, Jess Kent, and many others for performances on the worlds festival stages, television shows, award ceremonies, arenas and stadiums. 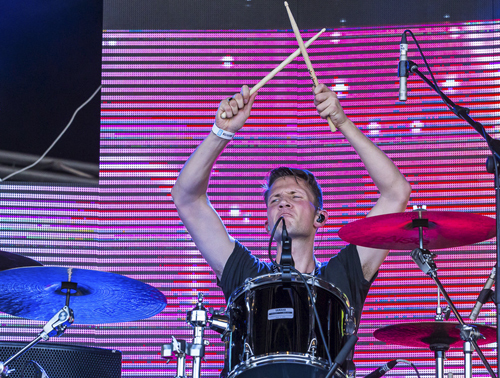 As a drummer, he has toured across five continents, most recently with Peking Duk (2017-current), Lisa Mitchell (2016), Broods (2014/15), Miami Horror (2013) and Van She (2012). Other artists he has performed or recorded with include The Australian Ballet, Mika, The Pierces, Boy George, Kim Wylde, Midge Ure, Heaven 17, Guy Chambers and winners of The Voice and X Factor. He has played many of the world's major music festivals including, Austin City Limits, Firefly, Bestival, SXSW, The Great Escape, Splendour in The Grass, Falls Festival, Lovebox, Stereosonic, Groovin The Moo, triple j One Night Stand and the BBC Proms; and on television shows including Later...with Jools Holland, X Factor, ARIA Awards, The Voice, Last Call with Carson Daly, MTV Live, Channel 4 Album Chart Show, Sunrise, Today, and triple j's Like a Version. He holds a First Class Honours degree in Classical Percussion from The Royal College of Music, London, where he attended on full scholarship as the ABRSM International Scholar.